Spray Cooler Technology is a process to convert Melt into solid state by Spraying into Spray chamber. Cooling media is usually dehumidified cold air. The cooling media is admitted into the Spray Chamber. The spray mist comes in intimate contact with the cooling media & gets converted into solid state. 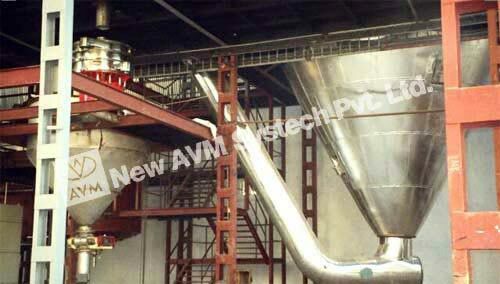 AVM offers Customized Spray Cooling Systems with variety of Configurations. Air Dehumidifiers & Coolers - using utility like Chilled Water, Brine etc. Air Dehumidifiers & Coolers - using direct expansion of Refrigerant, Ammonia etc. Heat tracing for feed line using hot water / steam / electricity as utility. Nozzle lance pre-heating, Heated secondary media for Two fluid nozzles. Re-circulation of exhaust gas for higher thermal efficiency. Safety accessories like Explosion vents with pressure shock resistant design for equipments, Vacuum breaker.